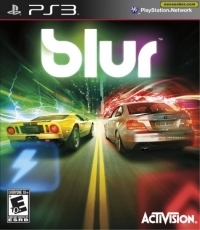 Description: Blur is the ultimate powered-up racing experience, dropping you into electrified action with a mass of cars targeting the finish line and battling each other as they trade paint. Utilize an armory of power-ups like huge bursts of energy, defensive shields, nitro speed boosts, landmines, and more to beat your rivals across the finish line. You choose how and when to use your arsenal of power-ups for ultimate impact in a race where the outcome is never certain. Blur's story unfolds through a unique community-based social network interface that includes 4-player split-screen multiplayer and online multiplayer. Blur is non-stop Powered-up Racing: An intense, unpredictable fight to the finish. This is a list of VGCollect users who have Blur in their Collection. This is a list of VGCollect users who have Blur in their Sell List. This is a list of VGCollect users who have Blur in their Wish List.